“To know the dog,” writes Clarice Rutherford, “you must first know the wolf.” Dogs, who have evolved to live with humans, can make wonderful companions if their humans understand them and teach them good manners for living in modern homes and neighborhoods. Further, the dog “always knows the feelings of his person—no need for words or woofs.” That bond can feel pretty special to a young person. These are the main themes in Rutherford’s cheerful and practical book for middle readers. Several chapters cover topics like the history of the dog, the keen senses and instincts that dogs enjoy, why dogs do what they do, their need for socialization, and how they can fit into a family pack. Two chapters focus on techniques for teaching dogs basic good manners and a variety of games and tricks. Throughout the book, stories, photographs, graphics, fun quizzes, and facts will attract young readers’ interest and provoke their engagement. 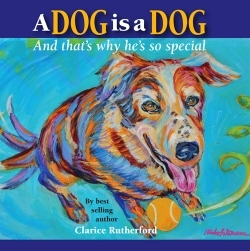 Rutherford’s attention to play and having fun with a dog is a notable strength of the book. Readers are introduced to a real dog named Corky and the boy who is training him, and the photographs and detailed training instructions feature a happy, playful approach. “Don’t grumble about training your dog. It’s a good way to get to know him better,” writes Rutherford. “Dogs love to play—to be happy. Take advantage of that. Show Corky that he can play, stop, pay attention, practice what you want him to do, be happy doing that, and then get more play time.” This sounds like good advice for the entire family pack, actually. At times the prose in A Dog is a Dog is a bit clumsy, and the last chapter repeats information covered in earlier chapters. But overall the book is a well-organized, practical, and satisfying read. A young reader could open the book to any page and find something of interest. The graphics are pleasing and kids will enjoy the funny photos of canines. A bibliography, a glossary, and suggestions for further reading provide additional information, and an afterword focuses on wolves. Rutherford is the co-author of two previous books on puppy training. She not only teaches dogs obedience and works with them on special skills such as hunting and tracking, but she is also involved in rehabilitating abused animals. This book will be a helpful guide in training a generation of young dog lovers to raise happy and well-mannered dogs.